You may remember from last year's Super Bowl Sweets that we the CW team know almost as much about sports as we do about weasel neutering. WHO'S READY FOR SOME FOOTBAAAAAAAAAAAALL?!?! I love the Seussian details; it looks like it's straight out of Green Eggs and Junk Food! It's a fact that Super Bowl parties are the only place where it's entirely acceptable, nay, expected!, to eat a whole bag of potato chips by yourself. RRRRuffles have RRRidges made out of fondant, and they're amazing. The only way I know this isn't a real bag of chips is how full it is. Usually when I open a bag, it's 75% air, 15% chip crumbs, and 10% greasy-fingered shame. Now, I know what you're thinking: those are real wings on cake, which is disgusting. I thought the same thing. So we called the baker in Tempe, AZ and asked her. Turns out they're made of fondant! Un-Be-Freakin'-Lievable. I just remembered that this is supposed to be a football post. Seriously, Mike. Did you steal a piping bag from Warehouse 13? Hey, you know what goes great with sports for which you care nothing? Pizza! It's pretty rare to see a pizza box cake. I love it. And check out the little mushrooms! Now I know what you're thinking: what am I gonna drink with all this junkfood, water? What do I look like, a health nut? What am I, a fish?! The bottles and ice on both cakes are made of sugar. Total homerun! Ok, I know what you're all waiting for. After all, you can't have the Super Bowl without some bone-crunching, cheerleading, touch-downing, grass-staining, FOOTBALL. Personally, the commercials are my favorite part of the Super Bowl. Like the Mighty Anheuser-Busch Clydesdales! D'awww. Who's a mighty widdle clydesdale?! It's you, it's you! Okay, okay, we probably need to talk about football or... something. So, the New England Patriots are playing. And I'm pretty sure they'll win because this cake is very tall and majestic. Although I hear blue balls are hard to run with. Have a great Super Bowl Sunday everybody! Or, ya know, just a Sunday. Have a Sweet for us? Then send it to SundaySweets (at) cakewrecks (dot) com. Or you're epileptic, in which case you drink raspberry lemonade. Tastes better than beer, anyway, and you don't get stupid. And I'm with you on the Warehouse 13 thing. My hair even looks like Claudia's (though I'm not the hacker she is). You might be an American, but after all those beers you know what you are? European (you're a'peein', get it?). Chicken wings on a cupcake isn't such a far-fetched idea! I just read a story the other day about a bakery in NY that makes a cupcake with a cornbread "cake", bleu cheese icing and a chicken wing on top - not such a bad idea, huh?? This post appeals to my non-sports side. Love the bag of chips thing, thanks for the laugh. I'll be watching the Puppy Bowl myself.. Much cuter. WOW! I am blown away. Simply blown away. You mean the Patroits and the Gaints are playing. Love, love, LOVE the haiku. Very well played. I seriously NEED that pig cake. I want to adopt it. Now bring on the commercials -- I want to see the dogs bark the Star Wars theme again. You know, I was semi-afraid to scroll down when I saw the words 'pig skin'. I'm still slightly scarred (and scared!) from that marzipan pig from a couple of weeks ago. This one is adorable, though! love it! another Sunday Sweets masterpiece of fun. Jen, you need to do what I do every year; grab some junk food and find an unused tv to watch the Puppy Bowl. Way more fun. What does the check box on the pizza box say? My something or mushroom? My room or Mushroom. Heh. Awesome cakes, but I think the links to the cake artists are wrong underneath. I tried clicking on all the links and they all go to the same flicker page. Fondant BBD coasters! *squee! * Forget the beer, I love the Purdue decorations! This is my most favorite Sunday sweet Punny post, Ever! blue balls, bwah ha ha ha ha haha ! ! February 5, 2012 | G.M.S. Thanks for this! I was wondering why the grocery store was so crowded today, so thankfully Cake Wrecks is here to teach me about the Super Bowel. I wouldn't have known which teams were playing, either . . . 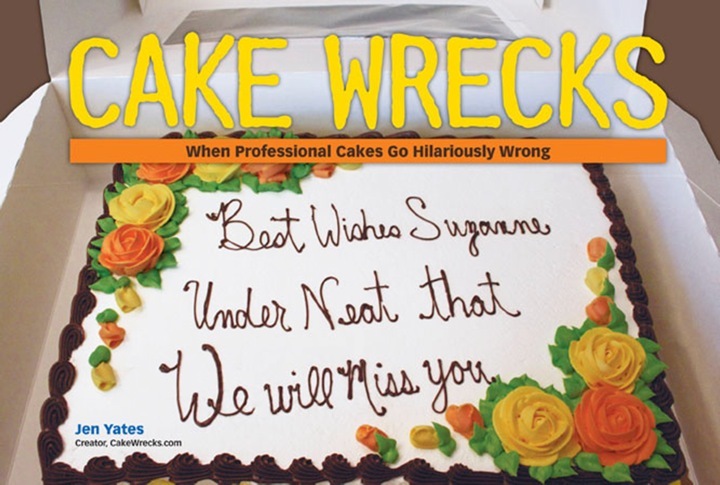 I'm with Wendy - I wouldn't have known who was playing either, if it hadn't been for Cake Wrecks. I promptly shared this information with my husband, who covered his ears and shouted "DON'T TELL ME - I DON'T WANT TO KNOW!!! La la la la la - I can't heeeaaarr yoooouuuu!" So thank you, Cake Wrecks, for not only helping me to keep up to date with the kind of info that the rest of the country thinks I should know, but also allowing me to tweak my husband at the same time - TOTAL WIN!!!! So, when will we get to see the Weasel Neutering wrecks you promised? take one small, strong rubber band. I would prefer real wings on my cake. Then you can have a little nosh and then dessert. Not that the appearance of those sweet wings ain't totally iimpressive. Finally - a football cake that looks like a football. Anyway, thanks for a very well-rounded post on all the things that make Super Bowl Sunday fun for all of us whether geeks, jocks, nerds, or something in between. Love the WH13 reference. Wonder who the piping bag would have belonged to....maybe Wayne Thiebaud? After prolonged use all your work began to have a pop art look, no matter what you were trying to create? i just threw up a rainbow that was so cute. Personally, I'd be pissed when I bit into those wings just to get a mouthful of cake. I love wings. Things are getting kind of quiet at DOC. The local bakery departments are simply not down to the expected standard for some reason. Maybe I just happen to live in an area with an unusual concentration of people who know how to make balloons that look like balloons and how to pipe brown frosting so that it doesn't suggest something else. Yeah, that's it. Or else they're pods. It could be that the bakery people are just playing it safe -- I haven't seen much writing on local cakes, which may have something to do with it -- but the pod theory explains more. Wreckerators are being held somewhere (perhaps by the arm) while pods have successfully integrated themselves into local bakeries, from which they will launch their plan to spread competence throughout society and from coast to coast. I have no plans to stop them, as long as they agree to put bakeries back like they were. I just thought you should know that this blog is the only reason i knew who was playing in the superbowl (and could impress all my friends). The blue ball would work better as a rugby ball. Since this is a football post, those sugar beer bottles are total Touchdowns (not homeruns...which is baseball). And way to go Giants! I LOVED that cute horse and your narrative is priceless! AWWWW!!!! That little Piggie is so CUTE!!! @Haiku Joy you just made the guys all flinch! "Fine. Here." LOL!! CW team, you are fantastic! You make my day every day. Really, though, that football is pretty cool. And those chips are amazing! And those wings? And those bottles? I am amazed, again. Thanks for doing Sunday Sweets and restoring some of my faith in decorators. The fact that you mentioned the warehouse makes me love this blog all the more! The Patroits are adroit, but the Gaints ain't. Nice Iron Chef America reference there at the end! I can't believe I'm the only one who caught that? Great post, Jen! LOVE the little piggy and the piglets - squee!! Haiku Joy - you are just too clever, too! Barbara Anne, that's exactly how my husband used to neuter goats when he was growing up. His job was to hold the goat, and his uncle's to apply the rubber band. There were special rubber bands available in feed supplies just for this. Somehow this sounds harder to do with weasels. Are weasels about ferret-sized? I think it would be more difficult to hold down the weasel. We don't say a person "goated" out of a tight spot, after all.